Opaque objects will most likely be shaded using the tile system, whereas transparent ones will rely on the cluster system. What is the benefit of using Clustered Shading with transparent objects? Is it related to performance, or are transparent objects not supported by Tiled Shading? Why opaque objects will "not likely" be rendered with Clustered Shading? Render the opaque objects' lighting parameters to a number of render targets. This is referred to as the "G-Buffer pass" or "base pass". Lighting is then computed in screen-space using the buffers of the first pass to compute lighting. The main benefit is that the cost of lighting is independent of scene complexity. This allows for much more complicated lighting equations with a greater number of lights. Full-screen pass to resolve all these buffers to a final color. The reason this doesn't work for transparent objects is that they must be rendered back to front completely shaded (lighting and all). If transparent object A is in front of transparent object B, B must be completely shaded when A blends its color with B. We need that final shaded color because the lighting parameters accumulated in G-Buffers cannot be blended. When using deferred shading, there is no limit on the number of lights that can affect a GameObject. All lights are evaluated per-pixel, which means that they all interact correctly with normal maps, etc. Additionally, all lights can have cookies and shadows. Deferred shading has the advantage that the processing overhead of lighting is proportional to the number of pixels the light shines on. This is determined by the size of the light volume in the Scene regardless of how many GameObjects it illuminates. Therefore, performance can be improved by keeping lights small. Deferred shading also has highly consistent and predictable behaviour. The effect of each light is computed per-pixel, so there are no lighting computations that break down on large triangles. 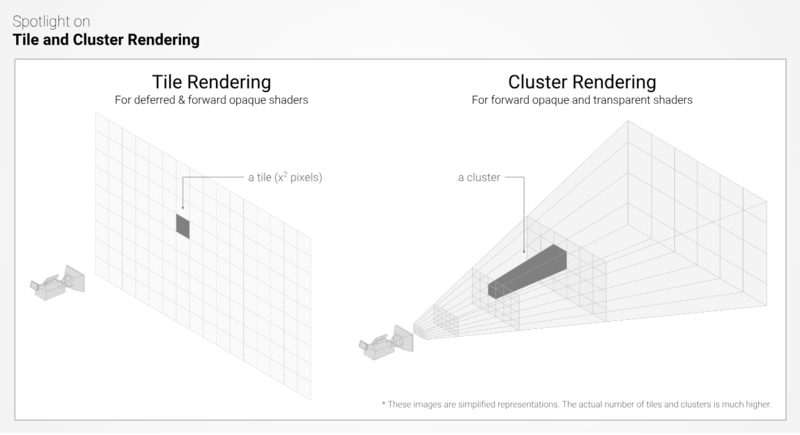 I wasn't able to find much information about Unity's clustered rendering. From what I gather it's an optimization technique for forward rendering, but it's still fundamentally the same process. Here's a very nice write-up of how it works in Doom (go to the "Clustered-Forward-Rendering of Opaque Objects" section). Not the answer you're looking for? Browse other questions tagged real-time transparency unity tile-based-rendering or ask your own question.